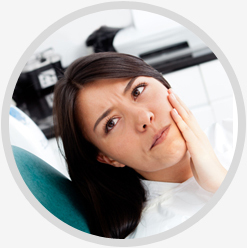 What Is Emergency Root Canal Therapy? How Does the Nerve Become Infected? The pulp of the tooth is supplied with nerve tissue as well as veins and nerves. The pulp can be infected by bacterial invasion. Dental decay can penetrate through the external hard tissue known as enamel, through the next layer known as dentin, into the pulp. The decay has bacteria which secretes toxin which are pathological to the pulpal tissue causing an irreversible infection in the tooth. Once the nerve becomes infected, the tooth must be either treated with root canal therapy or extracted. Left untreated, the infection can spread into the adjacent bone around the tooth, resulting in a dental abscess and cyst. Trauma can also cause the nerve to become necrotic as the blood supply becomes disrupted, a tooth requiring root canal therapy may be mild. 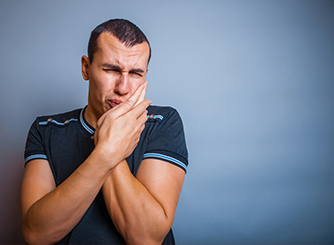 The symptoms of a tooth requiring root canal therapy can be mild, to severe swelling, redness, heat, and elevated temperature. The goal of the root canal therapy is to remove the infected pulp from the tooth with the removal of a minimum of tooth structure as to allow the tooth to remain as structurally intact as possible. A dental drill or hand piece is used to open the canal of the tooth, endodontic files of increasing diameter are used to remove and clean the canals. When the canals are clean and dry, the canals can be filled with gutta-percha rubber or which is the material mostly commonly used at this time. Sometimes a crown is required after endodontic therapy for strength.